I’ve never been a fan of pure mathematics. Even though I must admit that pure maths bears a lot of elegance, it’s real-world applicability that makes mathematical discoveries shine. Boy oh boy, how time flies! It’s summertime again, at least in the northern hemisphere, on this planet, and what a great time it is for drinking plenty of highballs. For those of you who don’t know: highballs are simple long drinks that are made up of two ingredients: liquor (eg. gin, whisk(e)y, rum) and a non-alcoholic beverage (eg. soda, juice, cola). Even though there are usually only two ingredients it is not that easy to make a perfect highball. It all depends on the right mixture. Some like their highballs stronger, others lighter. So how do you determine the perfect ratio? 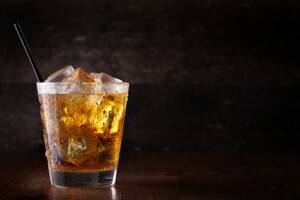 The task is complicated by the fact that the strength of the liquor used might vary (for instance, rums come with alcoholic strength levels reaching from 35% to 80%). In this equation, Vn is the volume (amount) of non-alcoholic beverage, Vl is the volume (amount) of liquor, R is the mix ratio, Sl is the alcoholic strength of the liquor used and Sh is the desired target strength of the resulting highball. Isn’t this wonderful? As an example, I happen to like my highballs with a strength of 10% and most liquor in Europe is sold with a strength of 40%. What’s the recipe for a perfect Gin and Tonic? Answer: 40% divided by 10% is four, minus one is three. Therefore, you would need three parts of tonic water for one part of Gin to make me smile. If you prefer a 5% Gin and Tonic (are you a wimp, by any chance? ), note that you will need seven parts of tonic water, not six, as a naive would-be drinks mixer would expect. There you have it — the formula for perfect, repeatable quality drinks. People in the same spirit (pun intended!) — let’s raise our glasses to this discovery! I know, I know. Some of you smug, mathematically inclined folks with an IQ of 180+ would probably have known this right away. I don’t mind if you point out that my pathetic “discovery” is obviously just a special case of something more profound. Congratulations! I will drink a very special toast to you tonight.